Yesterday, while looking through my video phonebook, a realised that almost everyone I know is still using an inferior telephone system. After ending a video phone call with my sister in the United States, I wanted to see a few old friends but it was impossible. Very few people have stepped up the game and are able to talk and see the person they're talking to (I'm not talking about using a computer and a webcam). Most people are stuck to a voice-only telephone system. It is worth mentioning that I moved past the voice-only telephone system more than 1 year ago and since then, phone calls have never been the same again. Talking on the phone without seeing the person I'm talking to no longer makes sense. If you ask people anywhere whether they want to pay less on a phone bill, the answer 100% of the time will be YES. But, in reality, many people still pay "an arm and a leg" for a phone service. 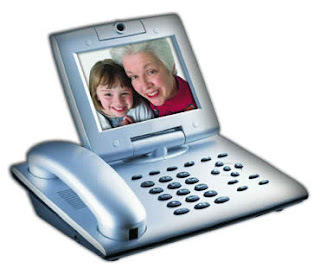 Most people don't know that they can actually make a video phone call without the burden of hooking up computers and webcams. And it's affordable! Today, we can conviniently talk and see family and friends from any part of the world without worrying about minutes. All we need is internet and electricity. I decided to blog on this in order to create awareness and to help my readers save money on phone bills they're already paying. The video phone has an inbuilt phone number and you can use the same phone number anywhere in the world. For example, I have a 678... Atlanta, GA number and if you call that number, it will ring wherever I'm (even if I'm in the moon). :) Right now, I'm blogging from Finland and if you call my 678... number, it'll ring right here. If I travel to Cameroon, my 678... number will ring right there. How cool is that? The Home UNLIMITED Plan ($30/month) includes UNLIMITED local, long distance and mobile calls anywhere in the U.S., Canada, Puerto Rico and the U.S. Virgin Islands. It also includes UNLIMITED landline calls to 75 calling areas throughout the world and to other GLOBALINX® customers in any location worldwide. What I like about my video phone is the fact that it rescues me from the burden of hooking up computers and webcams. It's a regular phone which helps me connect with my family like never before. I won't trade it for anything. Give me a sign if you'd like to connect with your loved ones on a new level. With the video phone, it's almost like being there! Don't compromise on an inferior telephone system.